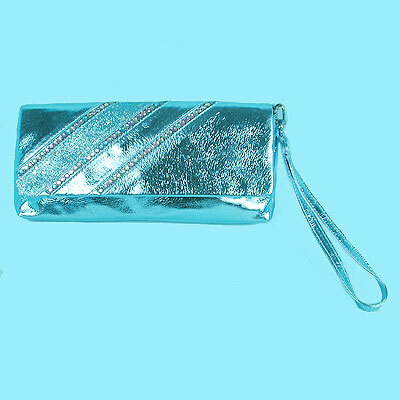 Long Metallic Faux Leather Purse with Sequins and Glitter This glitzy metallic faux leather evening purse in decorated on the diagonal with beads and glitter. This clutch bag has a matching wrist strap and snap closure on the flap. It comes in bright lime, light blue and pink. It has great pizzas for an evening or funky casual wear. Color: turquoise Hue: Code: #33FDFF.